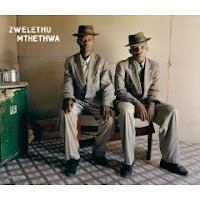 Comments/Context: After seeing South African photographer Zwelethu Mthethwa's show last year (linked below), as we often do, we went looking for more information to gain a better understanding of his entire body of work. Unfortunately, at the time, there were few good web resources on him, only a handful of broader surveys of African contemporary photography, and no decent monographs that we could easily consult. Happily, this situation has recently been resolved by the release of this fine collection of Mthethwa's work from the past decade. What I find exciting and original about Mthethwa's approach to capturing the post-apartheid world of South Africa is that unlike David Goldblatt's superlative images that are indelibly rooted in the nuanced history of the land, Mthethwa's pictures contemplate the realities of the immediate present, in a manner that forgoes a heavy-handed anthropological or documentary dissection, and instead employs a more intimate and humanist touch. All of the pictures in this book are portraits (even when they depict empty spaces); they tell stories of specific individual lives, wrapped in immense daily challenges, all in the context of larger forces that are often beyond their control. I think the two strongest bodies of work in this book are the early Interiors and the workers from Sugar Cane, but all of the images included find that delicate balance of pride and humility in the face of a wide range of difficult circumstances. Whether the people are digging in the red dust of a quartz mine, pounding on the rubble of bricks, posing against a mountainous wall of coal sacks, scavenging on rubbish heaps, or chopping down sugar cane with machetes, when they stop for a moment to face the camera, we see the complex mix of defiance, weariness, and strength of spirit that drives them to get by using whatever means necessary. The Sugar Cane portraits are the most successful of these worker images because they combine the inherent contrast of the verdant green hills, the texture of the rough stalks, and the vastness of the manual labor required to bring in the crop, with the alternating determination and indifference on the faces of the machete wielding subjects. The tension is what makes the pictures resonate. The interior images of worker settlements, shantytowns, and hostels on the outskirts of the big cities use the creation of personal space as a metaphor for the defense of human dignity. Regardless of the cardboard walls, corrugated tin roofs, or compacted dirt floors, these cramped spaces have been transformed into representations of the personalities of their inhabitants. In some rooms, newspapers and magazines cover ever inch of the wall space, creating chaotic clashing patterns of color. In others, the setting is more spare, with only a few pieces of improvised furniture or personal belongings, set against walls painted a uniform color, the bed neatly made. And yet when photographed within their own environments, the subjects seem to find themselves, and tell their proud stories of life in the present, opening up their vulnerabilities and sacrifices, and looking ahead with remarkable optimism. Part of the power of these pictures comes from their deft use of color (as is ably pointed out in the excellent essay by Okwui Enwezor). The contrasts of bright color bring life and personality to these images; were they to be executed in black and white, the same scenes would likely seem quite a bit more negative or depressing (especially given the predominance of deadpan expressions). Somehow, the colors seem thicker and more lush than usual: the rich pink of a floral linoleum, the soft light blue of a painted wall, the electric green of a patterned wall paper, the bright red of a dirty work shirt, or the neon orange of a pair of rubber gloves. Taken together, they plant us firmly in the present, settled into the rhythms of modern South African life. Aperture has got the timing of this book just right - Mthethwa has developed a strong and deep portfolio of work in the past decade, and this monograph has come along at precisely the right moment to expose it (with appropriate scholarship and editing) to a much wider audience. Collector’s POV: Zwelethu Mthethwa is represented by Jack Shainman Gallery in New York (here); a show of recent work was on view in the spring of 2009 (DLK COLLECTION review here). In general, his work has just begun to enter the secondary markets, with a small handful of lots selling between $8000 and $11000 in the past few years. Comments/Context: If we look at a spectrum of artists who employ a camera for image making, at one end we might place those who are single-minded in their use of photography, and at the other, those who use a variety of mediums for their artistic expression, with photography as just one of many ways to make a picture. For those at the multivalent end of the continuum, depending on which of their chosen mediums becomes most recognized or "successful", these artists often get categorized as single medium artists, even though they continue to use multiple methods tailored to specific circumstances or aesthetic goals. Frederick Sommer is one of those multi-talented artists who got branded a "photographer" from an early point in his career, thereby marginalizing, at least from the point of the world at large, the rest of his artistic endeavors. This museum quality retrospective exhibit makes a substantial effort to rebalance the Sommer narrative, to highlight the strengths of the photography, but in the context of Sommer's equally innovative drawing, printmaking, collage, and painting. 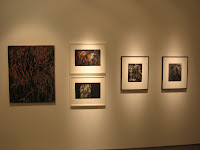 The picture that emerges is less of Sommer as the master photographer, but more of Sommer as a gifted artist who was exploring a variety of cutting edge, interconnected themes and ideas, probing the edges of the various available mediums to try and match his visual problems with the method that would most effectively be used to solve them. A tantalizing example of the linkages between Sommer's use of different mediums comes in the pairing of a painting and photograph, both from the mid 1940s. In the photograph, Sommer, documents the withered, bleached carcasses of dead coyotes in the desert, the bones and sinews left to erode in the parched landscape. While the subject matter is challenging, the print is precise and rigorous, Sommer's meticulous attention to detail coming through in a print of exceptional quality. The painting that hangs next to it mimics the tonalities, but heightens the contrast to dark black and pure white. More importantly, the specific details of the coyotes have now been abstracted into swirling, jagged outlines, a clear parallel to the beginnings of Abstract Expressionism. The pairing shows Sommer starting with a single subject (or set of ideas) and ending up with two wholly different artworks with surprisingly similar underlying compositions. Connections like these are all over this exhibit. 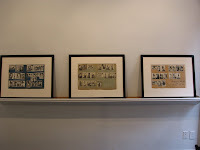 One wall connects a painting with a pair of glue drawings, only to have these ideas reappear further along the wall in photographs of smoke on glass and cut paper made decades later. 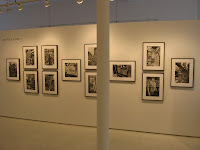 Another wall contains a series of Sommer's abstracted musical scores, where the score itself is transformed from specific notation into an open ended expression of layers, lines, and curves; hung amidst these scores is a 1950s photograph of architectural arches, echoing the multiple voices and harmonies of the fictitious music. 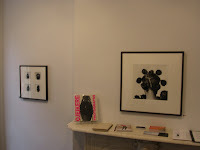 In the front room, early 1940s photographs of groups of puzzling found objects are juxtaposed with 1990s cut paper collages (mostly made from 19th century hand drawn anatomical diagrams), both exhibiting a staggering density of layered ideas, as well as painstaking attention to detail. The back room takes these ideas further, bringing together Surrealist skipreading (embodied in text heavy graphic prints), skeletons, and complete abstractions of the Arizona landscape - all looking for new ways to find meaning in easily recognized materials. The reason this show is important is that it broadens the story of Sommer's art beyond his cult follwing by a devoted minority and his veneration as one of the greatest photographic printers of all time. While this part of the story is still altogether true (take a close look at the prints for a breathtaking display of virtuosity), I came away with a much deeper understanding of all that Sommer was trying to accomplish during his long career. My conclusion is that Sommer was even more radical and talented than I had imagined; the back story makes the photographs stronger and gives them a more complete foundation. This is the first can't miss show of 2010, as it takes what we know about one of the masters of the medium and explodes it outward, encompassing a much more complicated and interrelated view of how the visual ideas he was exploring eventually resulted in his many original and iconic photographs. Sommer's photographs are often available in the secondary markets at this point, with prices ranging between $5000 and $85000 in recent years; his well known portrait of Livia (the girl with the mesmerizing stare) is the single image that drives the top end of the market. For our particular collection, while we admire much of Sommer's work, we continue to look for just the right photographs to fit into our specific subject matter genres. Unfortunately, the exquisitely detailed still life combinations, collages and abstractions don't really match any of our categories. The horizon-less all-over image of a heap of broken glass and bottles (Glass, 1943) is perhaps the single best fit for our city/industrial genre from Sommer's series of abstract Arizona landscapes. We have also spent some time looking for just the right example from his series of blurry nudes; there is a solid one on view here (Lee Nevin, 1965). 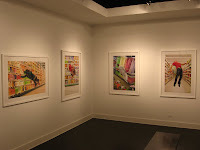 All of the works are from the period 2006 to 2009, except for the framed collection of images in the entry (executed as a single work) which is from 2002. There is one image which is duplicated (Arup, 2007) in two different sizes on two different walls. Comments/Context: When trying to put Wolfgang Tillmans into some kind of historical context, I have always thought he was a photographic descendant of Nan Goldin. Using a casual snapshot aesthetic, his work from the 1990s centered on himself and his inner circle of friends, often documenting small moments of intimacy, the exuberance of the club scene, or the chaotic afterparty mess found in the bedroom and kitchen. At first glance, many of the images seemed entirely forgettable, but with more sustained looking, I came to appreciate their genuine freshness and their ability to document the immediacy and hidden importance of the present. What I found intriguing in this show of Tillmans' new work is that he seems to have moved on from documenting the nuances of his internal life and has begun to look outward at the world around him with more deliberateness. Perhaps this is simply the result of being a recognized art world star, with a hectic travel schedule that takes him away from his close friends and to the far reaches of the globe, or perhaps it is a function of being a little older. In any event, there are very few of his signature shots of youth culture in this exhibit; no portraits or nudes of friends, no joking or beer bottles or full ashtrays. This is an externally focused Tillmans, seeing the cultural details and rich surfaces of what surrounds him, from Bangkok to Gaza, from Moscow to Tunisia. This evolution has taken his work away from the emotionally charged landscape of Goldin toward a cooler and more detached examination of the nuances of color and form, in the mode of Eggleston, with a youthful, international edge. An open window with a red mosaic tile edge becomes a complex composition of lines. A cage full of chicks dyed garish hues of pink, yellow, purple, and green becomes a painterly mixture of fuzzy blobs. The overlooked fabric on a long distance bus seat is suddenly seen to be a dizzying tangle of overly vibrant colors. Stacks of eggs in cardboard cartons become layers of unexpected geometries. This exhibition also has a very strong sense of time, of the 21st century "right now" and the interconnected world we inhabit today. This comes not from any single image, but from the cumulative effect of the pictures seen together. 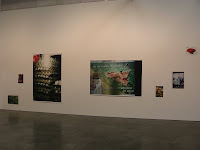 The specific installation of the works enhances this result I think - the huge images force the viewer to step back and take in a wider view of the gallery (and the interrelated themes being presented), while the small images require the viewer to engage in a more intimate conversation. This ebbing and flowing movement is then controlled by the sequencing of the images, where the story and mood of our less rooted and more anonymous international existence is slowly pieced together. Computer screens, views from open air taxis, tourist monuments, and people dressed in elaborate motorcycle leathers remind us of both the known and unknown around us. The image of the girl with her faced pressed up against a window is perhaps the most emblematic of this modern situation: on the outside, looking in, and seeing the strangeness around us as something both pleasing and unexpected. 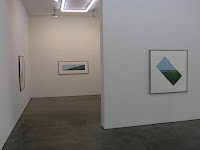 I have often thought that Tillmans' work likely performs best in groups rather than as single stand alone images, and this show has not changed my opinion on this aspect of his artistic approach; while there are quite a few startling hits in this show, there are also plenty of works that aren't nearly as memorable. To my eye, the standouts of this show are the still life of a pear in a plastic bag near a clove of garlic, and the two faltenwurf still lifes of rumpled clothes (one a yellow shirt, the other a pair of underwear). These alone are well worth a visit to this show. But it is the overall effect of the works seen together (especially in this unorthodox installation) that drives home Tillmans' unique view of the atmospheric visual overload of life as we know it. The large framed collection of earlier images (in the entry) is available as one work for $95000. 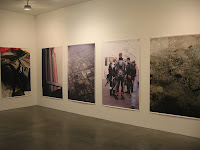 Tillmans' work is generally available in the secondary markets, with a handful of images on offer each season. Prices have ranged between $2000 and $50000 in recent years. As an aside, this exhibition is a great example of how scale changes the impact of an image. There is truly an amazing difference between a banner/poster sized work and one that is 12x16, and not all images work well (or at all) at various sizes. An intriguing side discussion would be to consider why Tillmans chose the sizes he did for the installation, and how the exhibit would have been different if different pieces were alternately large or small. For collectors, there may indeed be one "optimal" size for any given image, and it may not be the one that is currently on view. Comments/Context: Jan Dibbets has long been interested in the nature of perception, how perspective alters our view of space, and how the optics of the camera transform what is seen. In his newest works, the straight line of the horizon provides a perfect subject for his meticulous conceptual experiments. 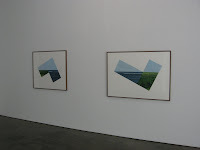 In each work, two color photographs (one of a blue seascape with waves, the other of a green and yellow landscape, both against pure light blue skies) are carefully aligned to connect the the two adjacent horizons, creating an unbroken single line that traverses land and water. This is the starting point for a wide variety of permutations on this theme, where proportions change, angles tilt, and rectangles and squares move above and below or side to side. In most cases, the spare horizon line runs parallel to the floor, and the geometries and triangulations occur in relation to the constant flat level point; in a few however, the horizon is jarringly slanted, sloping or ascending in an unexpected vertigo-inducing inclination, jolting the viewer out of the soothing simplicity of the construct. The most successful works in the show are those that are the most asymmetrical, where the weights of the two parts of the image are exaggeratedly uneven, or perhaps where the limits of the strict compositional device have been tested most. The chunky blocks of uniform sky reminded me of Josef Albers' exercises with squares, and I saw photographic relationships to both John Pfahl's altered landscapes to Hiroshi Sugimoto's seascapes. Overall, I found this show to be a satisfying and sophisticated mix of intellectual exploration and meditative repose. The works exhibit a level of craftsmanship and refinement that goes far beyond simple optical trickery and provide a fine example of the subtle power of well-executed conceptual photography. Collector's POV: While a detailed price list wasn't available, I was told prices for the images in the show generally range between $30000 and $97000. Dibbets' work isn't widely available in the secondary markets for photography; only a few lots have come up for sale in each of the past several years. While prices have ranged between $2000 and $50000, this data may not be entirely representative of his overall output. Given the right display environment, I think one of these constructions would hold an entire wall with ease, and would age well without looking dated. The challenge is that work like this doesn't interact particularly well with mainstream vintage or contemporary photography; the visual contrasts are just too great. As such, these works will I think be a better fit for contemporary art collectors interested in optical geometries (and with modern houses) or for photography collectors who have a special interest in conceptual or abstract photography. Photography-wise, Phillips fared the worst of the big three in the recent Contemporary Art sales in London. The auction house's photo results were quite a bit softer than the preceding sales at Sotheby's and Christie's, with the total sale proceeds for photography falling below the estimate range. For a sense of scale, Sotheby's total proceeds for photography earlier in the week were more than four times higher. The photography in Christie's recent Post-War and Contemporary Art sales in London generally performed in line with expectations, with the total sale proceeds for photography falling solidly within the estimate range. 92.86% of the photo lots that sold had proceeds in or above their estimate. There were no surprises in this sale (defined as having proceeds of at least double the high estimate). 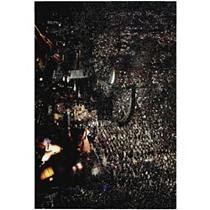 The top photography lot by High estimate was lot 72, Andreas Gursky, Madonna I, 2001, at £900000-1300000. It was also the top photo outcome of the sale at £1077250. The most expensive photograph sold at auction in 2009 was a Gilbert & George multi-panel work for $902500 (here); converting this Gursky sale to dollars (at 1 Pound = 1.56 Dollars), this lot brought in $1680510, easily the largest photography outcome in more than a year. Additional reports on the auctions can be found at Art Info (here), Art Observed (here), Art Daily (here), and Bloomberg (here), although none covers the photography on offer in any detail. ADMINISTRATIVE NOTE: There will be no posts at all next week (the kids are on vacation). We'll be back to normal posting on Monday, February 22nd. Comments/Context: The mobile phone tower is an excellent example of one of the necessary evils of modern life. While most people demand better coverage for their phones, town zoning boards and local residents aggressively fight the telecommunications companies to prevent the construction of massive eyesores that are visible from miles around. Both sides would like to somehow make these towers "invisible", and the current solution favored by many is to dress the towers up to look like trees, so they blend in better with the surrounding environment. Or at least that's the intention. 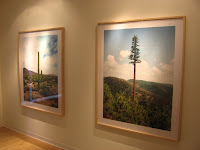 German photographer Robert Voit has spent the past several years scouring the globe, making pictures of these cell tower trees. Voit trained in Düsseldorf under Thomas Ruff, and so has absorbed many of the conceptual lessons passed down from the Bechers. Each image is rigorously composed, with the tower centered in the frame, using consistent portions of land and sky and generally similar scale. Given the diversity of examples in the series, the various towers can be hung together in pairs and typologies to get at the underlying themes and variations in the artificial decorations. The towers themselves are disguised as a dizzying array of species: there are palms and cypress, cacti and multiple types of evergreens, some with perfectly symmetrical branches, others with quirks and random limbs to make them look less fake. While a few do a satisfying job of blending into the environment, most have been transformed into caricatures of the natural world, odd sculptural forms that border on the absurd; it's quite easy to wander around this show giggling at the insanity of it all. Stylistically, while the debt to the Bechers is obvious, Voit has clearly taken some of the foundation concepts and adapted them to his own artistic approach. In contrast to the meticulously uniform backgrounds employed by his predecessors, Voit allows a wide spectrum of colors to float behind his subjects, from washed out whites to deep blues with puffy clouds (there's even a painterly pink and orange sunset). He's also allowed more locally specific context into the frame, showing the base station buildings and more of the surrounding natural environment; several of the images juxtapose the fake cell tower tree with a real tree or two standing nearby. Finally, while the works are conceptual, there is an element of subtle humor and satire in these pictures that dissolves away the cool detachment that is the hallmark of many of his mentors and classmates. Overall, this project contains a convincing mix of conceptual inversion and clever ridiculousness. As such, it has an element of fun that will broaden its appeal far beyond the usual crowd of ardent Becher adherents. Collector's POV: The prints in this show are priced as follows: the 60x50 prints are $9000 each, while the 24x20 prints are $2750 or $4000 (including the frame). Voit's work has no secondary market history, so gallery retail is likely the only option for interested collectors at this point. While I did like the large scale images quite well as individual pieces, I think these images will be most successful when hung together in groups. 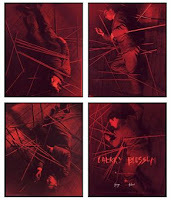 For those museums and collectors who are amassing a representative sample of the Düsseldorf school (or are planning the comprehensive retrospective for a decade from now), it seems obvious that a grid of 4, 6 or 8 of these small prints would be an important acquisition, especially since they represent the next generation of idea refinement (from the Bechers to Ruff to Voit). Comments/Context: For those of you that follow our photography conversation on a daily basis, it is likely obvious that we have recently been thinking quite a bit about the idea of multiple interpretations of the same image, digging deeper into how knowledge influences the emotions we ascribe to images. Perhaps this intellectual exercise has become a mini obsession, but I think the pictures in this book are yet another example of how the impact of a certain subject is significantly influenced by our understanding of its context. If we look back at the history of industrial photography, I think the 1920's and 1930's can safely be called the golden age of this genre (no disrespect to the Bechers). Whether your particular favorites are Charles Sheeler, Margaret Bourke-White, Albert Renger-Patzsch or others, the collective mood of the industrial images of this period was one of power and confidence, a Modernist celebration of the heroism and romance of machinery. The optimism of this age infused the pictures with a patina of awe-inspiring excitement that remains vibrant almost a century later. 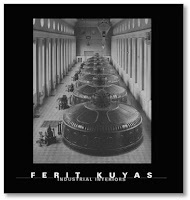 Ferit Kuyas' images of industrial interiors cover the exact same territory as his more famous predecessors: gargantuan machinery of all kinds (hydroelectric power plants, spinning mills, refuse incineration plants, metal working factories and breweries). There are turbines and engines, massive pipes and boilers, shop floors and gleaming duct work, all captured in pristine cleanliness and pure natural light. The difference here is that while the surfaces and textures of this equipment may still shine and glow, the fact is that these facilities have been mothballed, empty and abandoned for many years, entirely defunct in terms of any importance to society at large. We now live in the information age, and the industrial might of yesterday is now a forgotten relic. These are extremely well crafted pictures, with careful compositions that highlight the many patterns and geometries found in this kind of machinery; there is a tactile richness to the tonal gradations that makes even the most mundane of equipment seem lusciously polished. And yet, even with all of this pictorial beauty, these images in the end represent faded glory, a sad and melancholy reminder of what was, not a majestic view of our future success. Their emptiness ultimately represents failure, not triumph. If we were to hang Margaret Bourke-White's image of the turbines of the Niagara Falls Power Company (here) right next to Kuyas' image of the generator hall of the Eglisau power plant, even though they were taken more than 60 years apart, they would have a remarkable, echoing similarity. And yet we see one as energetic and romantic, the other silent and crestfallen - a fascinating transformation over time. Overall, I found this to be a thoughtfully executed set of modern industrial "portraits", with strong connections to some of the masterworks of the medium, well worth close consideration given our specific collecting approach. 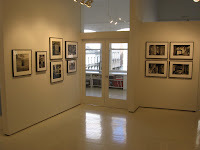 Collector’s POV: Ferit Kuyas is represented by Bau-Xi Photo in Toronto (here) and LUX Photo Gallery in Amsterdam (here). His work has not yet found its way to the secondary markets, so gallery retail is really the only option for interested collectors at this point. Collectors of industrial photography will find much to admire in Kuyas' work; any number of images from this monograph would fit nicely into our own collection. Comments/Context: A trip down the aisles of a large supermarket or big box store can often feel like an assault on the senses: walls of bright colors and eye catching graphics jostle for attention, offering a dizzying array of life changing features and suspect benefits. The choices attack from all sides, pummeling consumers with a nearly infinite number of ways to buy. French photographer Denis Darzacq has extended this simple metaphor to its logical conclusion by making startling images of young people drifting through the air amidst the consumer excess of French hypermarkets. Dancers dressed in everyday clothes alternately hang listless in the refrigerated section, dive face first near the shampoo, and lunge near the toilet paper. Every picture features a different flavor of mid-air balletic grace: falling, flying, floating, twirling and soaring, with some of the moves looking more like the unexpected reaction to an explosion or a fight, with bodies blown back, hanging face down like corpses or twisted like rag dolls. Since these works are not digital Photoshop constructions but actual stop-motion photographs, some of these moments of quiet, angelic hovering likely ended in punishing falls. The message is elegantly and exuberantly clear: there's an invisible battle going on in aisle three, and relentless consumerism is delivering a potent barrage of body blows. While we've seen this theme explored in plenty of contemporary photography, these works have a freshness and vitality that separates them from the depressing and hectoring hordes. Collector's POV: The prints in this show are priced in an escalating edition, starting at $7500, moving to $11500, and finishing at $15000, depending on the location in the edition. 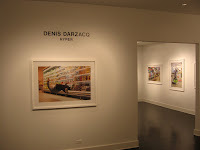 Darzacq's work has very little secondary market history, so gallery retail is likely the best option for interested collectors at this point. 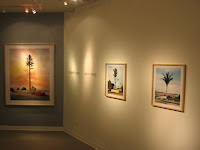 The various vintage prints hung in support of the main exhibit are priced between $2000 and $38000. JTF (just the facts): This is a two-person exhibit, with two relatively separate sections. 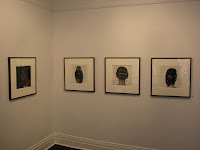 The Ojeikere works are framed in black and matted and hung in the main gallery space. There are a total of 11 gelatin silver prints, 7 printed as larger single images (approximately 16x16 square), and 4 printed smaller (approximately 4x4 square) and framed together in a grid. 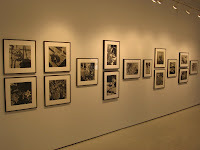 All of the prints are modern prints (from 2007 or 2009) made from negatives taken between 1970 and 1975; the prints are not editioned. Comments/Context: The best of African photography doesn't find its way to New York as often as it should, so we do our best to get out to see it when it does make a rare appearance. Private dealer Parker Stephenson has smartly paired images by J.D. 'Okhai Ojeikere from Nigeria and Malick Sidibé from Mali in this intimate show, highlighting two bodies of work that have parallels with the conceptual typologies that have become commonplace in contemporary photography. Like the Bechers and their industrial structures, Ojeikere systematically documented Nigerian hairstyles in the 1960s and 1970s, making deadpan portraits of the backs of heads against monochrome backgrounds. In these works, hair has been transformed into a sculptural medium: it is variously woven, braided, pleated, knotted, twisted, and piled into elaborate, ornate creations. The designs run the spectrum from tribal to botanical, complete with abstract patterns and intricate decorations. The project operates both at the anthropological level (a careful document of vanishing cultural traditions) and at a more conceptual one (a process-centric, objective comparison of forms). The similarities to the approach of the Bechers are striking, but the individual images are also strongly reminiscent of the up-close New Objectivity florals of Karl Blossfeldt - astounding designs and geometries found in unlikely places. While most collectors are already familiar with Malick Sidibé's funky 1960s studio portraits, complete with their eye-popping stripes and patterns, the posters on view here are a reminder of another facet of his work. As an active working photographer, Sidibé often attended parties and dances at all kinds of social clubs and venues, making casual pictures and simple portraits of the guests. The next day, he would gather the prints together on a poster outside his studio, complete with numbers underneath, so people could come by and order reprints of their favorites. These hand crafted maquettes are arrays of small black and white images, all the same size. Like his more formal studio portraits, the images capture the contagious energy of youth: the mix of traditional and Western dress, the obsession with new music (many people are shown holding up album covers), and the sheer joy of lively dancing and exuberant joking around. While these inadvertent typologies lack a rigorous conceptual construct, the multi-image display approach underscores the nuances of cultural change that were taking place. All in, this is an intelligent exhibit of under appreciated work, well worth a quick visit. Most importantly, I came away with the unexpected conclusion that a formal array of a dozen 1970s Nigerian hairstyles on a large white wall might compare surprisingly well with gas tanks, coal mine tipples, or framework houses. Collector's POV: The larger Ojeikere images are priced at $2500 each, while the smaller prints are $1000 each or $4000 for the grid of four. The Sidibé posters range between $18000 and $22000 each. Ojeikere's photographs have little or no recent secondary market history, so gallery retail is likely the only option for collectors interested in his work at this point. Sidibé's later print portraits and club scenes can be found at auction from time to time, ranging from $2000 to $5000 in the past few years. These vintage maquettes are however much more rare. 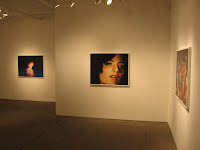 Sidibé is officially represented by Jack Shainman Gallery in New York (here). While I realize many of you read the New York Times as regularly as we do, the Ryan McGinley photo essay in the past weekend's New York Times Magazine (here) seems worthy of a short discussion. For those of you who haven't seen the pictures, there are eleven color images of Winter Olympic athletes, outfitted in designer clothing (lots of wispy strips of fabric) and soaring through the air (as required by their various sports) against soft, pastel skies. For photography collectors, these works will be immediately reminiscent of Aaron Siskind's Pleasures and Terrors of Levitation from the 1950s. McGinley has however traded Siskind's pared down, abstracted black and white silhouettes for unabashedly dreamy and romantic views. He has also expanded the scope of the pictures to include more sky, making the often graceful flying look even more precarious and unlikely. While not every picture in this series works for me, if these commissioned images are ever turned into artworks, I hope they are printed at monumental scale to cover a whole wall, the contrast between small figure and huge ground amplifying the peaceful bliss of floating. Comments/Context: Elisa Sighicelli's straightforward nocturnal compositions glow unlike any night scenes you've seen before. The effect comes from a clever adaptation of Jeff Wall's signature lightboxes: mask out large portions of the print from the back, allowing only certain areas to show through, enhancing the contrast. The result is that the dark black areas are extremely opaque, while the brightly lit zones pulsate with vivid luminosity. Most of the images depict massive, spotlit billboards, anonymous and often seen from behind, the glare of the illumination radiating out into the darkness. Others capture the gold glitter of a brilliant chandelier, the otherworldly glow of a planetarium, or the diffused radiance of a tangle of bamboo scaffolding that covers a building. While the compositions are unassuming, the character and quality of the light is different in each work, shading from smoky warmth to blinding pure white, alternately human and inhuman depending on the circumstances. I particularly enjoyed one of the videos (The Party Is Over), which depicts a fireworks display running in reverse. The shards and blooms of light retreat upward, imploding, as if they were falling into a black hole. The squelching of the light happens in a regular rhythm, over and over again, twinkles and sparks disappearing into the night; the effect is successfully meditative. The medium of photography is filled with exercises and experiments with light. These pictures are something tangentially different; they seem to be "about" light, how it conveys information, mood, and emotion, rather than a demonstration of how it is to be controlled for maximum pictorial effect. This is what is memorable here: it's not the infrastructure of the back of a billboard that matters, but the idea of its light as a beacon of truth, or an ominous consumerist nightmare, or simply an empty but beautiful abstraction, hovering in the darkness. 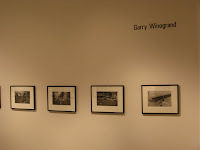 Collector's POV: The photographic works in the show are priced as follows. The 48x48 single panel images are $15000. The 5 panel group is $55000, while the 2 panel pair is $25000. The smaller 23x23 single panel is $10000. I didn't ask the prices for the videos. Sighicelli's work has started to appear at auction intermittently in the past few years; prices have generally ranged between $9000 and $17000, although the data set is pretty small. Comments/Context: One of the things I admire most about the Yancey Richardson Gallery is that the exhibition program consistently pairs vintage and contemporary works (using the main and project spaces) in smart ways; it is one of the few galleries in New York that effectively uses vintage work to provide a deeper and more rounded context for its primary contemporary offerings. This small show of a selection of Garry Winogrand's images from Women Are Beautiful is a terrific example of a clever pairing. Most collectors will be extremely familiar with this body of Winogrand's work, but the pictures take on a markedly different feel when juxtaposed with Alex Prager's staged portraits (review here). Winogrand's casual images of attractive 1970s women on street corners, at parties, at the beach or in the park were heavily criticized when they were first published; many found them too voyeuristic or exploitative, the "male gaze" gone overboard. 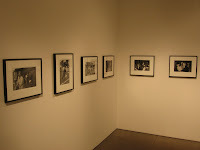 When placed next to Prager's new works, two surprisingly divergent views of women emerge: Prager's retro world feels hemmed in, the women trapped and closed off, left listless and bored by their roles; Winogrand's women have a lively sense of confident freedom, open and loose, unperturbed by the man with the camera. Overall, when hung in contrast, the Winogrand images do an excellent job of highlighting the crux of Prager's work; the overtly staged "women as actresses" concept is strongly enhanced by a look to these well known pictures from the past. While this show doesn't merit a detour on its own, it certainly creates a thoughful dialogue with the works in the adjacent gallery. 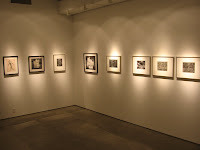 Collector's POV: The prints in this small show are priced at $3600 each, including the frame. 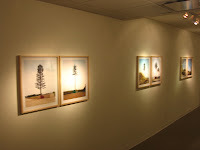 Prints from this series are routinely available in the secondary markets, ranging in price from $1000 to $6000. The entire portfolio includes 85 prints. 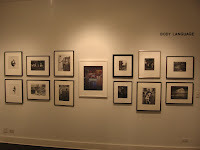 JTF (just the facts): A total of 8 color images, framed in white with no mat, and hung in the main gallery space. The chromogenic prints range in size from 36x47 to 48x62, and are all made in editions of 5. 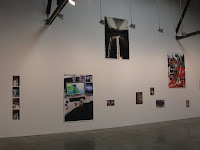 The works are all titled using the names of women, and were all made in 2009. 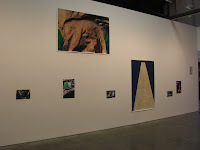 (Installation shots at right.) 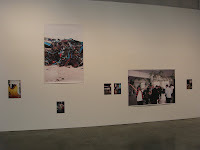 A companion exhibit of the same body of work is also on view at M+B Gallery in Los Angeles (here). Comments/Context: As we are photography collectors, we are constantly trying to put contemporary work in some kind of historical context, looking for connections to figures and influences from the past that will inform our understanding of what we're seeing now. As a result, I found it nearly impossible to see Alex Prager's new body of work without being immediately drawn back to Cindy Sherman's untitled film stills from the late 1970s; the similarities and echoes are pretty striking. Prager's staged portraits of California women are full of saturated colors and an exaggerated retro melodrama. Her models have been styled with dated wigs, bright red lipstick, and obvious fake eyelashes, covered in thick make-up and dressed in vintage polyester. They stare vacantly beyond the picture plane, resigned to the film noir tragedy that is about to occur, or tightly wound but trying to stay calm, struggling to protect their vulnerabilities; the cinematic role playing runs the gamut from coolly passive to wearyingly indifferent. Hypothetically placed side by side with Sherman's work, Prager's images have a more amplified and ambiguous tension. Sherman's stills were more conceptual and consciously neutral, with more distinct settings and narrative environments; in Prager's world, the staging is more spare and the situations are more intensely unclear - often all we're given is a head against a monochrome sky. While both bodies of work address the roles of women, the construction of personal identities, and even the creation of the idealized woman by the media, Sherman's fictions seem altogether more plausibly real, while Prager's have been extravagantly inflated to the point where nuances of gesture and facial expression are the only hooks we have to the unknown and mysterious story. While scholars might argue whether Prager's work is overtly derivative, the reality is that Sherman's film stills are generally beloved and admired, and Prager's pictures tap into many of the same themes, issues and emotions, but in a colorful, contemporary manner; it is no wonder there is a noticeable buzz in the air. Collector's POV: The prints in this show are priced between $3900 and $13700, with a variety of intermediate levels along the way ($4900, $5900, $7300, and $9500). Prager's work entered the secondary markets for the first time in 2009, but there were so few lots on offer/sold that it is hard to draw much of a pricing pattern. While large color portraits don't fit into our collecting genres, my favorite image in this show was Eva, who stands with her face raised up but her eyes closed, set against a backdrop of dark blinds. Comments/Context: It is my guess that there are very few (if any) artists in recent years who have created so much new work that they have merited taking back to back exhibition slots at a prominent New York gallery, but the prolific Lee Friedlander has done it with this unusual double play. 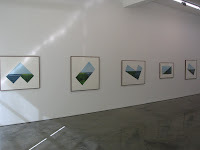 The first part of this show last December was one of our top photography shows of 2009 (here), so I have been avidly looking forward to seeing part two to see what other tricks Friedlander has up his sleeve. 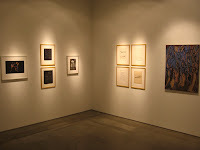 In contrast to the amplified effects of the previous show, this exhibit has a much more subdued and subtle feeling. While there is another selection of shop window reflections on display, these works are less slashingly chaotic and confrontational; for the most part, the scantily clad mannequins have been exchanged for oriental carpets, spools of thread and fabric bolts, New York city tourist trinkets, and elaborate cakes. The signature flattened picture plane and overlapping reflections are ever present, but the overall effect is somehow less jarring. Perhaps there is a little Friedlander fatigue going on; if these same images had been shown six months from now, perhaps I would have seen them with fresher eyes. A second set of works center on Friedlander's own bookshelves and the tabletop displays of family photographs and personal memorabilia in his home. Elementary school pictures of children and grandchildren are clustered amidst the books, overlapping and mixed together with a Polaroid of Friedlander with Bill Clinton, a post card of Tina Turner, a sheet of postage stamps of Ella Fitzgerald, and the words "best grandpa". There is also a layer of intellectual voyeurism here, achieved by considering which great novels have been selected and saved by the photographer over the years. This is a much quieter and more personal view of the artist than we have seen before, and one that is clearly steeped in the passing of time. But these images are less recognizable as signature Friedlander, as the jolting compression and abstraction of the picture plane is meaningfully less pronounced. A third group of pictures uses flowers and plants as its main subject matter. Several of these works take a straight top down view of the flowers in vases, using the shadows of the window frames and nearby Adirondack chairs to create additional patterns and intersecting lines. While the rest of the vegetation images are a jumble of intertwined plant types, these unexpected bird's eye floral views are something we haven't seen before; they're an unusual motif we'd like to see Friedlander explore more deeply and exaggerate even further. My favorite picture in this show doesn't fit into any of these neat groups. It mixes fishing tackle (lures, weights, and gloves thrown onto a piece of plywood) with a shadow self-portrait. The plywood table bisects the picture plane, creating two layers of different depth; it's a classic Friedlander visual puzzle to be carefully unpacked. Overall, while there are a handful of excellent pictures in this second collection, this work is less consistent than the images in the previous show. Perhaps it merely comes back to a question of editing; even when you are as talented and prolific as Friedlander is, maybe there just aren't enough astounding new pictures to fill two big gallery shows. 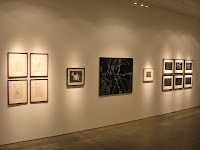 Collector's POV: Once again, the prints in this show are priced at $5200 or $7400 based on size. The market for Friedlander's work has not changed in the past month, so see our previous post for details about secondary market pricing and recent auction history.